Urbain Jean Joseph LeVerrier was born in St. Lo in Normandy, France on March 11, 1811. As a boy he showed an aptitude for mathematics when he attended school in Caen, but he was turned down from the prestigious Ecole Polytechnique in Paris. In order to help his son, his father sold the family home so that LeVerrier could attend the College de St. Louis in Paris. A year later, when LeVaerrier reapplied to the Ecole Polytechnique his application was accepted, winning the mathematics prize. LeVerrier graduated in the top of his year and briefly took a job working for the chemist Joseph Gay-Lussac. In 1837 he returned to the Ecole Polytechnique as an astronomy assistant. His first major piece of work was looking in to the stability of the solar system. In 1840 Dominique Arago, the director of the Paris Observatory, suggested he look into the motion of Mercury, which he did. LeVerrier predicted the start of the transit of Mercury of May 1845 to within 16 seconds. Next Arago had LeVerrier look in to the motion of Uranus, which was not moving as predicted. LeVerrier calculated that the perturbations of Uranus' orbit were due to the presence of another planet, further from the sun than Uranus. Unknown to Arago and LeVerrier, in England, John Crouch Adams had previously reached the same conclusion. Adams had sent his work to George Airy, the royal astronomer and James Challis, the director of the Cambridge Observatory. Neither man acted on Adams' findings until after LeVerrier had published his work in June of 1846. 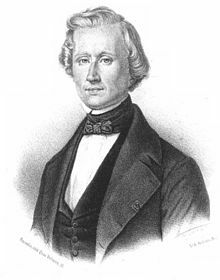 After LeVerrier published, Airy attempted to observe the planet, but it was not seen until September of 1846 when what would be named Neptune was observed by Johan Galle and Heinrich d'Arrest in Berlin. In 1849 he was elected to the French Legislative Assembly. In 1852 he was appointed a senator and member of the Superior Council of Public Instruction on which he served until 1870. When Arago died in 1854, LeVerrier became director of the Paris Observatory. He was removed as director in 1870 but was reinstated in 1873. He was awarded a gold medal by the Royal Society of London in 1868 and 1876. He has craters named after him on the Moon and on Mars and he is one of the 72 names inscribed on the Eiffel Tower. He died in Paris on September 23, 1877.